I wandered into the SIC on the 6th of April around 1100 and heard an amazingly loud roar followed by 4 bangs...and that's when it hit me...those were the V8s downshifting from 6th to 2nd gear at the end of the start-finish straight to take turn 1 on the circuit. The first thing I probably screamed out was something not very nice, but then no one could hear me :D Here I was...on an F1 circuit and it really hadn't sunk in at that point. I just stood there and grinned like an idiot for 5 minutes before calling my dad and screaming into the phone (over the sound of the engines...). No words can describe the scream of the V8s down the start-finish straight and the bangs as they shift gears. The cars move so fast that you can barely make out the drivers. Photographing them isn't an easy task, simply because of the speed :D The above is prolly the best shot of Massa I got across the 3 days and this was taken during the race (and he was doing over 300 Kmph..since the shot was taken down the start-finish straight). If you're an F1 fan, you absolutely should go to a Grand Prix in your lifetime, simply because the TV doesn't quite cut it. The sounds of the engine are one I will never forget for a long time to come. Awesome. Amazing. Brilliant. 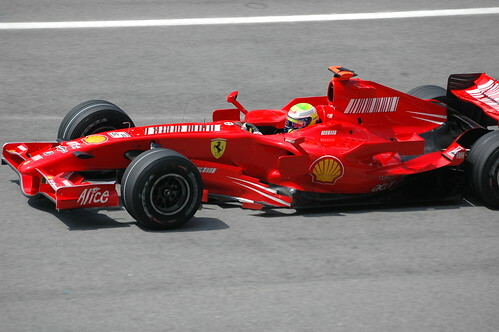 Ferrari didn't win, and that was a disappointment but I'm sure they'll bounce back. This season should be very interesting to watch. PS : Tons more pics to come, I managed to get shots of Kimi, Alonso, Mika (yes, Hakkinen...god bless the 70-300 :p), Nico, Trulli, Rubeno....it'll take a while to upload them all and I'll make a few more posts regarding the trip later. As for following the race, we got to see a few slipstream moves...but most of the action was away from us. But then obviously it isn't like the TV, where you can follow a lot of action. Depending on where you are sitting, you get a decent amount of action. Like I could see all the pit stops. Will try to make it to one someday. Yes!!!! You surely need to man. I got to see a part of the podium, I was a bit too far off to see all of it. I saw Alonso and Kimi accept their trophies and do the champagne gig... but it was quite far off. Yo man!! Waiting for the pics. Just can't stop about my Malaysia trip. :) It was magical! wow sounds like quite an experience! what's 19000? rpm i suppose? Yeah, it's the rpm the F1 engines are limited to, till 2010 for cost savings. Where are the pics...................... You are one lucky dog!